I was touring the internet and came across this. I . . . don't know how to feel about it. I searched for this show but found nothing else about it online, so I guess it never came to fruition. Maybe Ann M. Martin issued a cease and desist, who knows. 1. 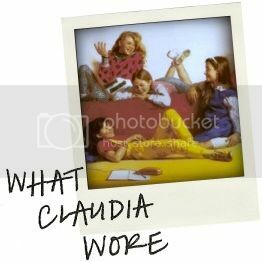 I kinda accidentally lost the whatclaudiawore.com domain and the company sitting on it wants $$$ to get it back, so, um, we've returned to the super fetch blogspot.com url. I own whatclaudiawore.co (small comforts) so maybe I'll set that up one of these days. Just more evidence that I'm the most dedicated blogger out there! 2. Sometimes I see things that make me think of Claudia and I add weird captions and put them on Pinterest. It's like a mini-dose of Stoneybrook fashionz. Enjoy! Or don't. Don't let me tell you how to live your best life. Oh no oh no oh no, how dare they ruin my innocent memories! Though I gotta give them props for getting movie Dawn & movie Stacey. P.S. Been following your Pinterest board for awhile now and absolutely love it. You're so good at Pinterest! Being good at Pinterest is totally a mixed blessing . . . I want evvverrrryythinngggggg. Whatever it was, I can't see it and am dying, what was it?! Love it! Top notch blog! Love to visit here again. Thanks for the ultimate post!! To no real significance to anything, I found the girl who played Stacey so pretty and with 'it girl hair' to boot. Much like Logan liking MaryAnne, I find myself kind of liking this strange thing.